The Pinto pony hunters, "A" Circuit Pony prospects, Colored Sport Horse prospects, Colored Sport Horse broodmares, Paint Horse hunter / jumpers, finished Sport Horses, and all-around performance horses and ponies listed on this page are in various locations around the United States. Karen has unquestionable ethics in equine sales. Contact her for details on any of these fine horses or ponies. After you check out this horse and pony classified page, go to the Karen Griffith Farms Sales List to see a great selection of high quality Paint and Pinto horses and ponies bred and raised at Karen Griffith Farms. Fancy Medium palomino mare. The best pony to learn on with a huge stride and an adorable jump. She has won consistently on the A circuit and was in the top ribbons at Pony Finals this past year. She is already qualified for next year's Pony Finals. Click here for more photos of this featured Palomino Pony Mare. Click on the thumbnails below to view individual ponies for sale. There are several more classified ponies for sale that are not as yet online. Call or e-mail Karen to find out what is currently available. The list is constantly updated. Champion Jumper - Great on Trails! Luke Skye Walker: Hungarian Warmblood cross gelding, a Five year old and 16.1 hands. He has been shown in Tucson, AZ. and Santa Rosa, CA. winning 2nd in the level 1 and 2 jumper divisions. He has also won championships in the 3' and 3'3" pre-green hunters in local MHJA shows. He will do the 3'6" and 3'9" next year. 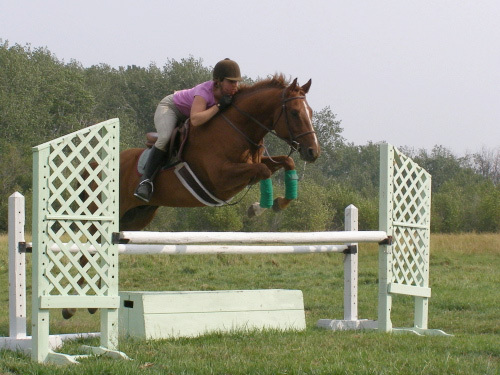 Luke is great on trails and would make and excellent foxhunting horse or event horse. Luke's great temperament makes him easy to haul, bathe, clip, and handle day to day. 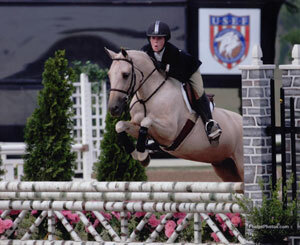 His sire is currently showing in CA with a young adult rider. 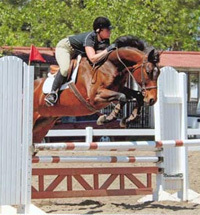 He has a very easy going temperament that is great for youth and adult riders. Click here for more photos of this featured Hungarian Warmblood Cross Gelding. Click on the thumbnails below to view individual horses for sale. There are several more classified horses for sale that are not as yet online. Call or e-mail Karen to find out what is currently available. The list is constantly updated. Large Pony Hunter: Show mileage a plus. Have customers for "A" circuit pony prospects. Safe, kind and willing with children. Large Pony Hunter: Successfully competing on the "A" circuit. Uncomplicated, exceptional mover and form over fences. Medium Pony Hunter: Needs to be ready for the shows. Auto changes. Have customers for "A" circuit pony prospects. Safe, kind and willing with children. Small Pony Hunter: Needs to be ready for the shows. Auto changes, uncomplicated. Draft horse, gelding: Must be solid black. White markings acceptable. Minimum height 17 hands. Must have nice gaits for riding. Full tail a must. Hunter, mare or gelding: 16 hands or over. Good mover. Jumping a course with lead changes. Pinto markings a plus. Ready to go to the shows or has show mileage. Karen has unquestionable ethics in equine sales.